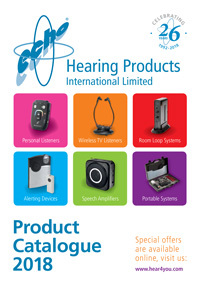 Hearing Products International endeavour to answer any questions or enquiries our customers may have and this page contains answers to commonly asked questions about our range of products and uses. How do I get sound on HD channels or ‘Catch Up TV’ when using optical cable (toslink)? You may be able to solve the issue by changing the settings on your TV or freeview box. On your TV or freeview box (i.e. Virgin box). Go to Settings - Sound - Digital Audio Output - HDMI - Normal. It may be set to Dolby Digital and should be set on NORMAL. If this does not provide the solution, please contact your Television manufacturer. An induction loop system helps people who use a hearing aid or loop listener hear sounds more clearly because it reduces or cuts out background noise. At home, for example, you could use a loop to hear sound from your television. In your car you can use a loop system to help you hear the stereo or radio. You can also set up a loop with a microphone to help you hear conversations in noisy places. In the theatre, a loop can help you hear the show more clearly. An induction loop is a cable that goes around the listening area. An electric current is fed to the loop by an amplifier that gets its signal from a connection with a sound source. This can be a sound system or TV set, or a microphone placed in front of the person speaking. The current in the loop produces a magnetic field and you can then pick up this magnetic field if you are sitting within the area of the loop and your hearing aid is set to ‘T’. You can adjust your hearing aid for volume in the usual way. How do I use an induction loop system? If you have a hearing aid with a ‘T’ setting, simply switch it to ‘T’. If you do not have a suitable hearing aid you can still use a loop, but you will also need a ‘loop listener’. Some loop listeners are small boxes with headphones – others are worn as an earpiece. More than one person can benefit from a loop installed in a room as long as they each have their hearing aids set to ‘T’ or they are using loop listeners. You are not wired to any other equipment so you are free to move around and listen from anywhere within the loop. How do I set up a loop system in my home? You can install a loop system yourself or ask someone who is good at DIY to do it for you. Installing the loop wire itself is the trickiest part as it is usually placed round the edge of the room at skirting board level. Take care to install the wire securely. You can route it over doors and window frames as this does not affect how well it works. Always follow the instructions. The loop amplifier is normally placed close to the source of sound and then connected directly to it via Scart/ Audio Out or Optical Digital Socket. If you can’t connect your loop system directly to your TV or other sound source, you can use a microphone to pick up sound from the TV set's loudspeaker. To operate this, just plug the amplifier into the mains socket, position the microphone and switch on. Can other people hear the Television if I use a loop system? Using a loop system with a television or hi-fi means that if you are with a hearing person you can set the volume to a level that is comfortable for them. You can make the sound louder for you by adjusting the volume on your hearing aid or loop listener. You can also adjust the tone on the loop amplifier. Can I hear other sounds and conversation when I am using the loop? You can use an extra microphone to pick up the sound of your telephone or doorbell ringing or conversation, so you don’t miss these while watching television. Alternatively, if your hearing aid has a combined 'MT' setting, you can use this to hear sound through the microphone and through the loop at the same time. How do I connect my product to the TV? Digital Optical Audio Output. Many of the newer TVs no longer have analogue audio output, they have digital optical audio out or coaxial audio out. This socket is found at the back of your TV. To connect to this you would require a Digital to Analogue Converter that can be purchased from us. ALTERNATIVELY - The new MegaLoop DAC room loop system has an integrated digital to analogue converter. Audio Output. On the television usual a red and a white socket located on the back of your TV and usually indicated by a circle with an arrow pointing out of it. Microphone on Speaker. Using the velcro pad provided please fix the microphone securely to the speaker at the point of sound. How do I know which product to choose for me? There are many different products to choose from. It is important though to firstly identify what your needs are, for example: Is it for just watching the TV at home? (If yes, see our Wireless TV Listeners or Loop Systems) Is it for conversation and communication while out and about? Or in meetings? (If yes, please see our Personal Listeners) Do you wear a hearing aid? (If you don’t then you need to choose a product with a headset.Personal Listeners or Wireless TV listeners) Do you need something portable or something more permanent? Do you require a product that is compatible with your Modern TV connections or Plasma TV? Look at the product information on each product page and choose the product that would best suit you. If you can’t decide, contact our sales office, they can help you. I don’t have a scart / audio output on my TV, how do I connect my product? If your TV is a more modern one, then you may find that it only has digital optical audio ouput. If so, you will need a Digital to Analogue Converter, available from us. This will allow any of our TV listening devices to be connected to a digital optical audio output. Or you can try the new MegaLoop DAC, which is a room loop system with an integrated digital to analogue converter, easy set up to new TV's with one simple Toslink cable (provided with room loop system). I have a plasma TV, can I use your TV listening products? The only products that cannot be used with a plasma TV are ones that use infra red signals (Echolink & EchoIR), this is because plasma and infra red are not compatible with each other and will result with interference. What is digital optical audio output? This is a type of connection found on modern TVs. It produces a digital signal rather than a analogue signal. If you have this you would require a Digital to Analgoue Converter to connect our products to your TV. OR the new MegaLoop DAC which is a room loop system with an integrated digital to analogue converter. Can I use a different kind of headset to the ones provided with my equipment? Yes, our products use a standard 3.5mm stereo headphone socket, so as long as the headset you want to use has a 3.5mm stereo jack, it will be compatible with our equipment. I have trouble hearing my telephone, is there anything that can help me? EchoChime300 Home Alerting System - The Chime300 and Telephone Signaller will alert you to an incoming Telephone call with a sound and flash. What is a loop pad? Can I use a neckloop without a hearing aid? No, the neckloop works in conjunction with the hearing aid being switched onto the "T" position, there is a magnetic field that is created by the neckloop and then the sound is picked up through the "T" coil in the hearing aid. A neckloop works in the same way as a room loop system only on a much smaller scale. Because it is worn around the neck, the magnetic field created is only small and therefore creates your own personal loop. Can I use re-chargeable dry-cell / batteries with MiniTech? Yes, you can use re-chargeable dry-cell / batteries. This is beneficial if the unit is being used throughout the day. We also sell a battery charger for rechargeable batteries. Can the MiniTech be connected directly to the television? Can you leave an induction loop on all the time? Yes, as long as the amplifier is in a well ventilated area. What size room can I loop with an induction loop? You can use up to 50m of loop wire with our induction loop systems. A 38m reel of loop wire is provided with all our room loop systems and this will cover a very large lounge / dining area, approx 80sqm. Can you use an induction loop without a hearing aid? No, to use an induction loop system anywhere, you will need a hearing aid which has the "T" setting. If you do not have a hearing aid with a Telecoil, you could purchase an induction loop listener, which enables you to listen loop system using a receiver and headset. Please see our VAT relief page. What if the product is not suitable for me? If you find the product is not suitable you can return the product to us within 14 days and will be entitled to a full refund. Please see our terms of sale. I have a pacemaker, can I use a neckloop? Persons with pacemakers or other medical devices should ALWAYS consult their GP/ physician or cardiologist BEFORE using the device. NeckLoops should not be worn by persons with pacemakers. Please contact your GP or cardiologist for further information. What is the cost of delivery to UK mainland? Can two or more people use your wireless TV listeners?